Addison’s disease (also referred to as hypoadrenocorticism) is a disease caused by a reduction in corticosteroid secretion from the adrenal gland. The adrenal glands are located in the abdominal cavity medial to the cranial pole of each kidney. Like the kidneys, both adrenal glands are retroperitoreal (situated or occurring behind the peritoneum) in position, lying ventral to the psoas minor muscle. The hormones produced by the adrenal glands include cortisol, a stress hormone, and aldosterone, a hormone that regulates the body’s levels of the minerals sodium and potassium. What happens to a dog with Addison’s Disease? The symptoms of Addison’s Disease are very vague and many dogs may have symptoms for a long time before it is actually diagnosed. These symptoms often come and go, further complicating the diagnosis. This is an “Addisonian crisis” and is considered a medical emergency (but so long as the dog is taken to a vet/hospital in a timely manner, it is completely treatable). Where can I learn more about Addison’s Disease? Check out this comprehensive guide to Addison’s Disease in Dogs. It includes tips, advice, and detailed information related to diagnosis, prevention, treatment, which breeds are most at-risk, and more. Other than that, if you’re a pet owner talk to your vet, and if you’re a vet student talk to your professors and classmates! Interested in exploring the entire canine anatomy in 3D? 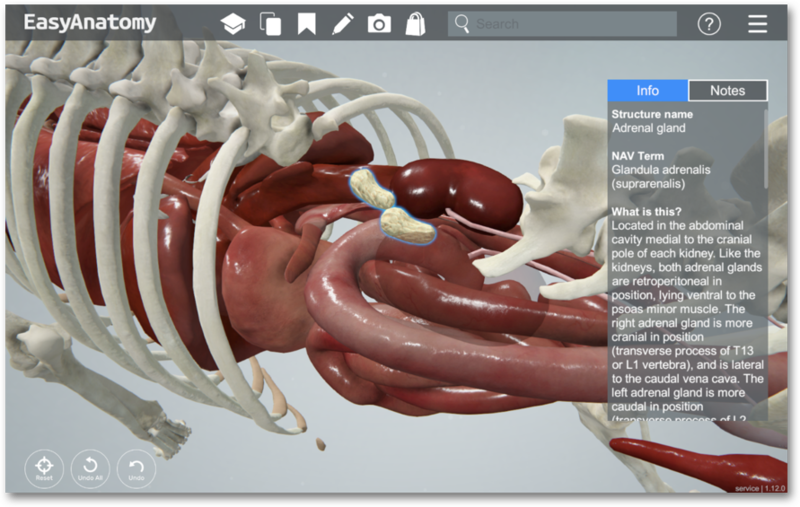 Try EasyAnatomy for free!